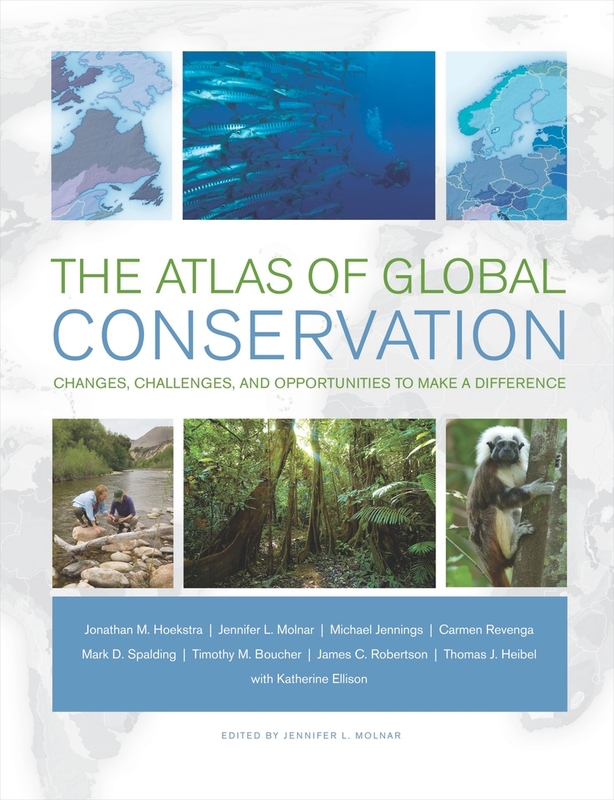 Visually rich, up-to-date, and authoritative, The Atlas of Global Conservation is a premier resource for everyone concerned about the natural world. Drawing from the best data available, it is an unprecedented guide to the state of the planet and our most pressing resource and environmental issues. Top scientists at The Nature Conservancy, the leading conservation organization working around the world to protect ecologically important lands and water, have joined forces to create this extraordinary reference. It features 79 richly-detailed, fullcolor maps and other graphics paired with an informative, inviting discussion of major trends across the world’s terrestrial, marine, and freshwater environments. Interspersed throughout, essays by noted international authorities point the way forward in confronting some of our greatest conservation challenges. Currently, Jonathan M. Hoekstra directs The Nature Conservancy’s Climate Change Program and teaches at the University of Washington. Jennifer L. Molnar is a senior scientist on the Conservancy’s Ecosystem Services Team. Michael Jennings is an adjunct professor at the University of Idaho. Carmen Revenga and Mark D. Spalding are senior scientists on the Conservancy’s Marine Team. Timothy M. Boucher is a senior conservation geographer for the Conservancy’s Ecosystem Services Team. James C. Robertson is GIS manager for the Conservancy’s Colorado Program. Thomas J. Heibel is a technical research associate at BCS, Inc. Katherine Ellison is a Pulitzer–Prize winning investigative journalist and author of three books including The Economy of Nature. Gretchen C. Daily, Marilyn Cornelius, and Charles J. Katz, Jr., Stanford University, and Brian Shillinglaw, New Forests, Inc.